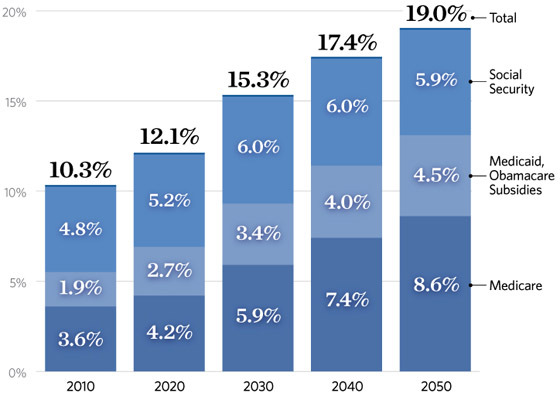 by Alison Meyer, Harrison Investigates: President Obama has called Rep. Paul Ryan’s budget “an attempt to impose a radical vision on our country,” but as this week’s chart illustrates, if something radical doesn’t happen, entitlement spending will nearly double by 2050. The amount of spending on Medicare, Medicaid, Social Security and Obamacare subsidies will soar over the next 38 years, leaving future generations with an alarming debt burden. The April 23 report shows that all people who receive Social Security benefits face about a 25 percent benefit cut as soon as 2033—three years earlier than predicted in last year’s report. The program’s long-term deficit is now larger than it was before the 1983 reforms. In order to pay all of its promised benefits, Social Security would require massive annual injections of general revenue tax money in addition to what the program receives from payroll taxes. Starting in 2010, Social Security began to permanently spend more than it takes in. From now on, Social Security will require large and growing amounts of general revenue money in order to pay all of its promised benefits. Even though this money will come technically from cashing in the special-issue bonds in the trust fund, the money to repay those bonds will come from other tax collections or borrowing. The billions that go to Social Security each year will make it harder to find money for other government programs or will require large and growing tax increases. The problem extends to Medicare as well. Like other entitlement programs, it’s also on an unsustainable path, a situation made even more dire by Obamacare. That’s why Heritage has offered a plan that would reduce the debt and fix the entitlement crisis. It’s called Saving the American Dream, and like Ryan’s budget proposal, it actually solves problems rather than punting them to a future generation. Tags: Chart of the Week, congressional budget office, entitlement spending, medicaid, medicare, Obamacare, Paul Ryan, Saving the American Dream, social security, Heritage Investigates To share or post to your site, click on "Post Link". Please mention / link to the ARRA News Service. Thanks! Way passed time to tackle all the freebees!! !